We are proud to release the May 5, 1975 Deposition of Terry Norman, a Kent State University student who was also working for the FBI as an Informant and Provocateur at the time of the shootings in the May 4, 1970 Kent State Massacre. 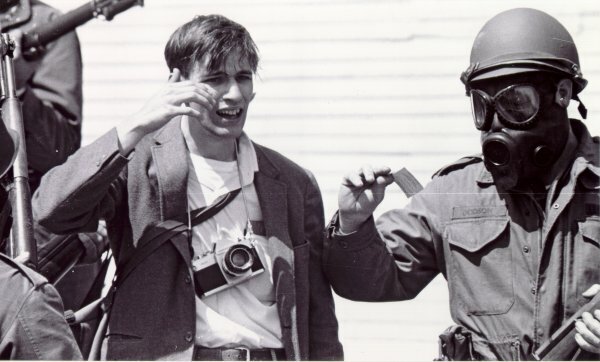 It is alleged that Terry Norman, the subject of this deposition, was the only civilian carrying a loaded low-caliber weapon at May 4th Kent State and that he fired his pistol four times 70 seconds before the Kent State command-to-fire, initiating the ‘sound of sniper fire’ and signaling the military personnel to shoot at unarmed Kent State protesting students. For the first time, Americans may read what Terry Norman had to say about his actions during the historic Kent State protest against the Vietnam War on May 4, 1970 at Kent State University where four students and protestors were killed, nine were injured. READ the Terry Norman deposition for notable reference to Norman’s activities ‘in his own words’. See pages 32, 48, 68, 69 and 70+ in this Norman deposition. Is Terry Norman still alive? What about the guardsmen? Is anyone today trying to seek these people out to see if they are ready to tell the truth about what happened? Laurel, very much looking forward to digging thru this deposition and seeing what gems can be gleaned from the perspective of 44 yrs down the road. Thanks! The more I read about this creep, the more I think he was the one who fired his gun , which made the guardsmen open fire…This scumbag really needs to be looked into further. He keeps popping up in one of about every 5 articles/reports I read and the more I read, the more suspicious this guy becomes.